Primus in Montreal or Quebec City? Inform me about the next events for Primus. Enroll yourself to our priority waiting list for Primus to be alerted when new tickets are available. Filling this form doesn't engage you to any purchase. 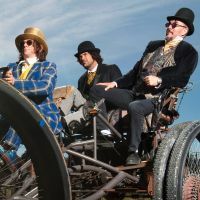 Primus is coming back to Montreal on October 4th, 2011, at the Metropolis. The American three-piece will release a new album on September 13th, 2011. Entitled Green Naugahyde, this 7th studio record in the band's history will be the first one since Antipop in 1999. As of 2010, Primus is : Les Claypool (bass, vocals), Larry Lalonde (guitar) and Jay Lane (drums).